Today’s world is characterized by volatility, uncertainty, complexity, and ambiguity. In business, this has led to the evolution of management accountants from scorekeepers to copilots of enterprises of all kinds, providing strategic insights and becoming business partners. With this shift comes a change in the type of skills, knowledge, and abilities needed for a successful career in the profession. Those of us teaching future management accounting professionals need to ensure that our students are prepared for the new role and teach them how to be entrepreneurial leaders. Babson College, where we teach and which earned endorsement from the IMA Higher Education Endorsement Program, developed a rigorous program to do just that. With curriculum elements that specifically prepare students for successful careers in areas such as financial planning and analysis (FP&A) or in roles like controller or chief financial officer (CFO), Babson’s educational program helps future management accounting professionals accomplish their career objectives and meet the competency expectations of employers while creating great social and economic value wherever they go. Babson’s undergraduate curriculum aims to help students develop their strengths, pursue their passions, and create their path to success. Since the school began in 1919, a Babson education has been built on the foundational principles of idealism, intensity, and practical application. In the early days, students took a pledge to embark on a business career as a means of rendering service to humanity. Today, Babson’s rigorous yet flexible curriculum supports the mission of educating students to become entrepreneurial leaders who create great social and economic value everywhere. We define entrepreneurship as new venture creation, corporate innovation, and family business. It isn’t enough for Babson graduates to know and understand everything they possibly can about business. They are taught the deeper, foundational skills that can help them succeed in business (see “Babson Learning Goals”). The foundation for teaching entrepreneurial leadership is Babson’s Entrepreneurial Thought & Action® (ET&A) methodology. ET&A comprises the practices of play, empathy, creating, experimenting, and reflection. Babson students learn that action tops everything. “Act—Learn—Build” becomes their mantra. The curriculum supports the action orientation by integrating across disciplines in innovative ways. 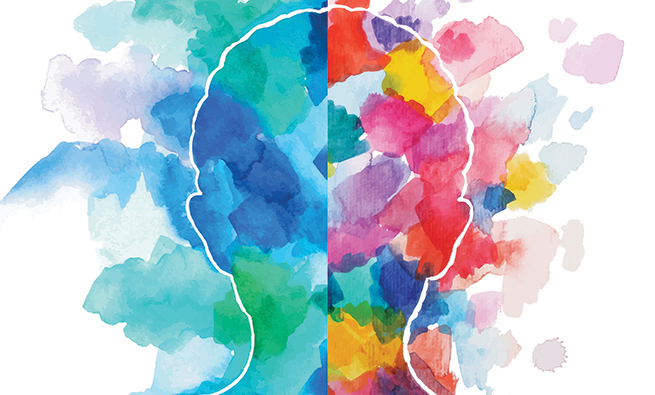 For example, one strength of the Babson business education curriculum is that it’s deeply rooted in liberal arts, bringing together business fundamentals with the arts and sciences since most businesses are based on art, science, or a combination of both. The signature Foundations of Management and Entrepreneurship (FME) course—taken by all students at Babson—exemplifies this approach. FME is a two-semester entrepreneurship and organizational behavior course taken in a student’s first year. A crucial aspect of FME is that students help begin and operate a business during the year. At the beginning of the course, each student must propose a business idea. The class then votes on which business ideas are most attractive, and the best ideas are reworked into business start-ups for teams of up to 10 students. Each team starts a business with loans of up to $3,000 from the school. Each business must meet regulatory requirements. The teams must market and sell their product or service and pay taxes. At the end of the academic year, they close down the business and report to the greater Babson community the results of the business, what issues arose, and how the team addressed them. Part of that final presentation is to prepare a complete set of financial statements. Current and former auditing students act as consultants helping the FME entrepreneurs develop internal reporting processes, and then they audit the financial statements near the end of the second semester. All profits from FME businesses are sent to a local charity the students choose from a list provided by Babson. FME businesses have yielded about $500,000 in donations to organizations such as Special Olympics, Habitat for Humanity, Cradles to Crayons, and many more. Students learn valuable lessons from linking their FME businesses to charities as they experience giving back firsthand. Choosing their cause motivates them to do well as a team so that they can support their charity monetarily as well as through their time volunteering. FME gives Babson students the opportunity to immediately apply what they’re learning about financial accounting when they capture transactions and build financial statements for their FME ventures. For this reason, undergraduate students also take the Introduction to Financial Accounting course during their first year. Since integration is one of the overall characteristics of the curriculum, Introduction to Financial Accounting was designed to link with other courses that the students are taking and will take in their studies. 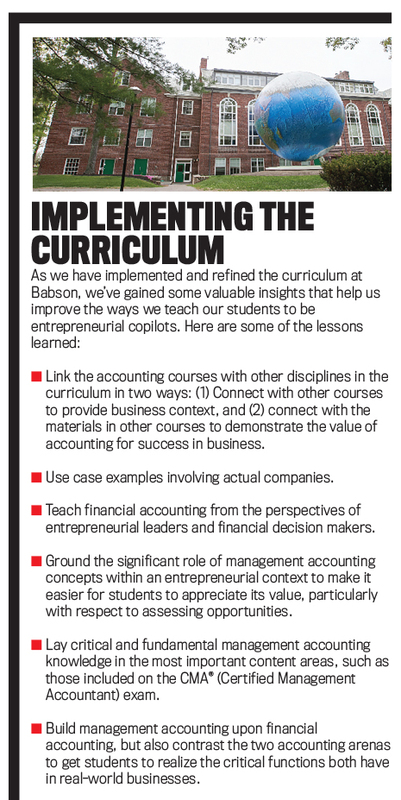 As most students won’t be accounting majors, and this is the only financial accounting course students are required to take, the course is designed to cover what Babson faculty believe every entrepreneurial leader should know and be able to do. Students use examples from actual companies as they learn how to prepare, analyze, interpret, and forecast financial statements. Introduction to Financial Accounting integrates with other business disciplines to illustrate how decisions in any area of a business affect the financial statements from the beginning. Students learn to identify how financial statements reflect the footprint of both industry and the company’s business strategy, a skill they refine over the course of the semester. Next, students learn to capture and analyze transactions through the use of the balance sheet equation, followed by constructing the income statement, balance sheet, and cash flow statement. The course quickly moves on to address issues that would normally be taught in upper-level courses by incorporating advanced subject matter so that by the end of the course students are able to forecast and analyze financial statements for investment decisions as well as model and analyze the financial effects of different strategic directions as an owner of a company. Part of Introduction to Financial Accounting is devoted to opportunity assessment, which supports the generation of business ideas within FME. Opportunity assessment includes concepts such as market research and sales potential, the structure of an organization, the cost associated with a product or service, the organizational structure to support an opportunity, and fixed and variable costs. In teaching these concepts, we use the students’ FME business ideas as well as real-world examples. 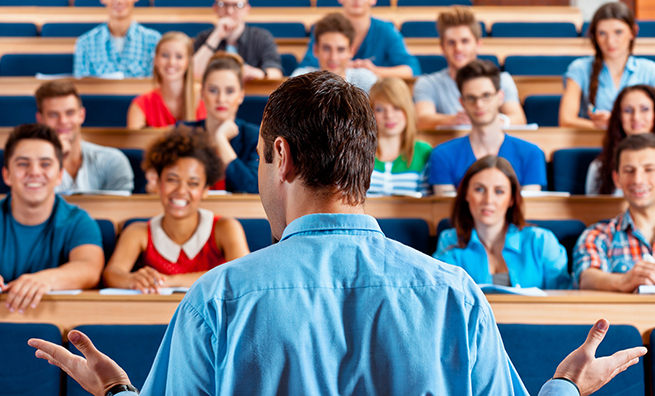 This framework allows instructors to connect the financial accounting implications of decisions made across a broad spectrum of business disciplines, and students have their FME business experiences as a context in which they can readily apply the opportunity assessment concepts presented in Introduction to Financial Accounting. Small businesses rarely achieve financial success immediately, and students must learn to deal with financial difficulty as well as success, particularly as they operate their FME business. Babson is the academic partner of the Goldman Sachs 10,000 Small Businesses initiative, and instructors are able to use cases about some of the businesses in that initiative as well as other companies to provide real-world case examples. Students see what happens when a company struggles financially and learn how to consider what decisions these businesses should make to become successful—the results of which will be reflected on their financial statements. Recognizing the parallels with the challenges that the students face in their FME businesses provides a rich environment for engaging students to understand the relevance of the financial accounting concepts being taught. Opportunity assessment transitions into financial statement analysis. Introduction to Financial Accounting uses real company data despite the inherent messiness and complexity contained in the financial statements of publicly traded companies. We purposely introduce real data to reinforce the idea that the students will benefit from financial accounting for both their careers and their investments. By the end of the course, we want students to be comfortable with a 10-K report and appreciate the complexity of financial statements as well as the related disclosures. Applying both time series and cross-sectional analysis, students learn benchmarking in an applied and realistic setting. Financial statement analysis then leads to forecasting and sensitivity analysis. Using financial statements and financial statement ratios as a basis for analysis, a series of what-if scenarios are presented initially by professors and next by the students themselves. Then these scenarios are applied to the financial statements to see what effect various decisions can have on the financial well-being of an organization. Introduction to Financial Accounting discusses accounting choices and estimates broadly so that students learn to appreciate judgments to be made and that the net income reported by a company could legitimately have been another number. These financial reporting choices are discussed within the framework of sensitivity analysis as are related ethical considerations. The SME courses complement the FME by immersing students in well-designed subject matter that relates to their FME experiences. Four of the six SME courses form complementary pairs, integrating the concepts covered and work done in both courses. One pair is Principles of Marketing and Managing Technology and Information Systems. The other pair is Managerial Accounting and Technology and Operations Management. This pair focuses on the internal organization and processes required for entrepreneurial leaders and managers to successfully test and execute business strategies. Class sessions take place back to back—and occasionally together for business simulations—because management accounting and business operations, broadly defined, are indivisible if a business wants to be successful. To be effective, entrepreneurs and managers must design operations, model the expected performance of operational designs, make decisions that strategically manage costs, and take actions that achieve desired results in an ethical manner. By integrating these two courses, students experience how management accounting information influences operational and strategic decisions, and vice versa, as they perform basic management accounting analyses such as costing of cost objects, cost behavior, differential analysis, and performance measurement—using the results of their analysis to evaluate the design of operations, make strategic decisions, and propose action. Issues covered include selecting a profitable mix of products and services, analyzing profits and costs during product development, budgeting for operations, analyzing whether to outsource or insource activities, and managing performance through the balanced scorecard and other measurement systems. The remaining two SME courses are Principles of Finance and Principles of Microeconomics. In Principles of Finance, students develop their valuation, financial forecasting, and capital budgeting skills. They also gain an understanding of the cost of investor-supplied capital as well as investor expectations regarding risk and return. Principles of Microeconomics considers the complex and dynamic economic environment of enterprises. Microeconomics provides a framework that explains firms’ adjustments to changes in market conditions as well as government policies and laws, including taxation. It rounds out the business foundation courses by the end of the students’ second year at Babson. Students spend much of their time in their junior and senior years pursuing various advanced electives in liberal arts and business. They may choose to concentrate in one or two specific subject areas by taking three to four courses in that area. 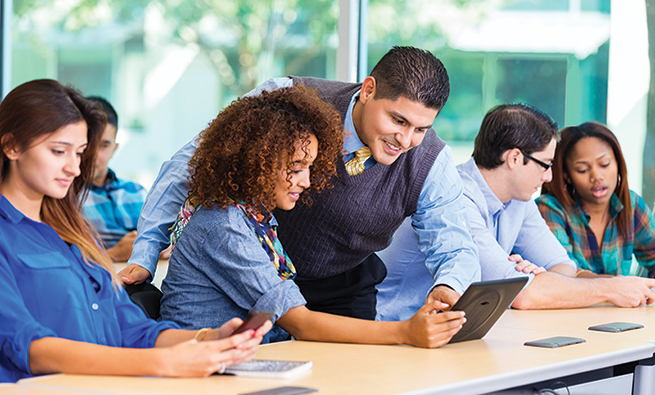 This flexibility allows students to align their education with their career aspiration. Managerial Financial Planning & Analysis (FP&A) is one of the concentrations currently offered. The FP&A concentration requires students to take several intermediate courses: Financial Reporting and Analysis, Financial Planning and Cost Control, and Corporate Financial Management. They also must take one of the following courses: Entrepreneurial Finance, Financing and Valuing Sustainability, Managerial Economics, Corporate Financial Modeling and Decision Tools, Corporate Financial Strategy, or Global Financial Management. These choices (as well as a long list of others) are available as free electives. 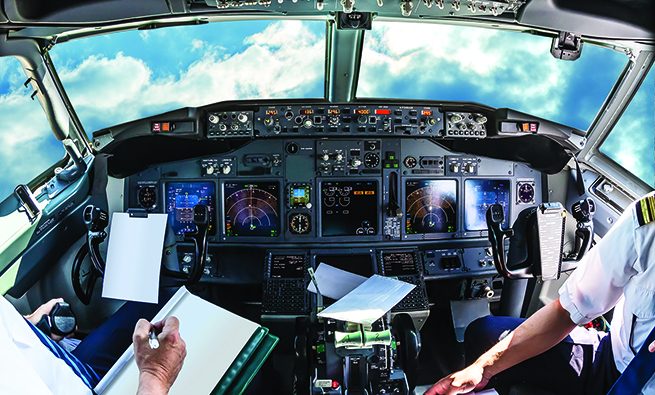 When a plane encounters turbulent weather in the air, the pilot and copilot have to collect and consider all the relevant data available and make the decision whether to fly through, over, or around the turbulence, making the best choice for the safety of the passengers. When business organizations respond to challenges of managing change, they, too, are faced with choices. Since the managerial function involves using information for better planning and control, management accounting is important for effective and successful strategic change at all levels within the ­chosen or changing business model. Once students begin their job search, a question they face is: Would a business owner hire me with the skills I have now or am developing and invite me to copilot the business? To be able to answer, yes, students will need to have ways to assert their value to their potential or even current employers. Simply earning a university degree likely isn’t enough. Students need to immerse themselves in the skills that are important for success in business. Seeking IMA endorsement of our curriculum was a way to signal to current and prospective students that Babson is committed to helping them develop value-added skills. Students pursuing careers in financial management and accounting are encouraged to be strategic in their thinking and decision making. Strategic control and cost management frameworks are part of our curriculum to help students develop approaches to support strategic decisions. In the effort to support strategy implementation, management accountants don’t function in a vacuum. To be successful, a management accountant interacts with professionals in internal audit, financial accounting, IT, tax, and other areas and plays the key role of bringing together all the information from these various units prior to directing it to planning, controlling, evaluation, and decision-making activities throughout the organization. For us educators, this means that it isn’t just what we teach, but also how we teach that makes a difference. 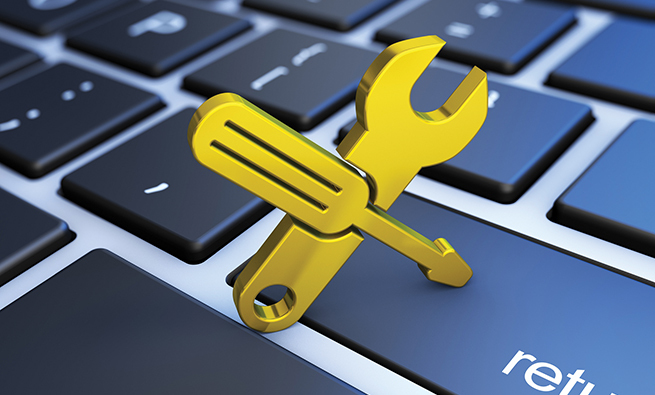 We help students look beyond functional silos and domains to see business problems in a more holistic way. Real-world problems seldom come compartmentalized by academic discipline, so we seek integration across disciplines. Effective management accounting is about improving decisions and building successful organizations. Because it brings to light the most relevant information and applies analysis to help organizations generate and preserve value, management accounting is at the heart of quality decision making. We recognize that traditional management accounting techniques will continue to play a role in terms of cost-benefit and incremental costing-based impact, and we continue to teach the fundamentals of our disciplines. Yet the complexities of fast-changing markets mean relying on traditional approaches and analyses is insufficient. Part of our role is teaching students flexibility, which can give them the ability to experiment with new ideas and act in new environments. By helping students identify, assess, and shape opportunities in a variety of contexts, our curriculum helps them recognize how to use creative and innovative approaches to create value for stakeholders and society at large. Our approach helps students move beyond simply understanding or knowing to being able to apply and act. It helps them define the world rather than being defined by it. Various predictions indicate that many business and financial jobs will be lost due to technological advances in this digital age. If students were to think in terms of simply doing repetitive accounting work that can be automated easily and performed more reliably and faster by a bot, they would indeed be at risk of losing or not finding employment. To be successful management accountants of the future, they must learn skills that will allow them to continually adapt. We seek to develop our students’ innovative minds with skills in critical thinking, data systems and ­analytics, and professional judgment. This emphasis is increasingly important in the new digital age that encompasses Big Data. With all the data that will become available, entrepreneurs will need help—help managing the data, help performing analytics, and help with decision making. The structure of our curriculum helps students learn how to ask the right questions and go out and collect the right data as opposed to simply processing and analyzing data that currently exists. We’re moving them away from just computing numbers and moving them toward finding insights by trying to determine and understand what the results mean for managers. Profit maximization and shareholder value creation are no longer sufficient as the focus of management decisions. There’s an increased emphasis on environmental and social impacts. The Babson curriculum prepares students to act on and shape opportunities that create value for their organizations, their stakeholders, and society at large. They explore new territories in new ways. As business copilots, they ensure a safe, productive trip. Weerapat (Go) Attachot, CMA, CSCA, CPA, CGMA, CIA, CFE, Ph.D., is an assistant professor at Babson College. He can be contacted at wattachot@babson.edu. William Coyle, CMA, CPA, Ph.D., is an associate professor at Babson College. He can be contacted at coyle@babson.edu. Paul Juras, CMA, CPA (inactive), Ph.D., is the Vander Wolk Professor of Management Accounting and Operational Performance at Babson College. He is a member of IMA’s Charlotte Chapter and can be contacted at pjuras@babson.edu. Brigitte Muehlmann, CMA, CFM, CPA, CGMA, CVA, Ph.D., is a professor and chair of the Division of Accounting & Law at Babson College. She is a member of IMA’s Boston Chapter and can be contacted at bmuehlmann@babson.edu.